Boehner's plan would leave the shutdown in place while raising the nation’s $16.7 trillion debt limit and setting up negotiations between the GOP and the president over spending cuts and other issues. WASHINGTON — The nation’s economy on the line, President Barack Obama and congressional Republicans groped inconclusively Thursday for a compromise to avert an unprecedented U.S. default and end the 10-day-old partial government shutdown. “We expect further conversations tonight,” House Majority Leader Eric Cantor said cryptically at nightfall, after he, Speaker John Boehner and a delegation of other Republicans met for more than an hour with Obama at the White House. Yet it seemed the endgame was at hand in the crises that have bedeviled the divided government for weeks, rattled markets in the U.S. and overseas and locked 350,000 furloughed federal workers out of their jobs. Both sides expressed fresh hopes for a resolution soon. The up-and-down day also featured a dour warning from Treasury Secretary Jack Lew, who told lawmakers that the prospect of default had already caused interest rates to rise — and that worse lay ahead. Senate Majority Leader Harry Reid advanced legislation to simply raise the debt limit and stave off the threat of an unprecedented federal financial default — a measure that Republicans are likely to block unless he agrees to change it. 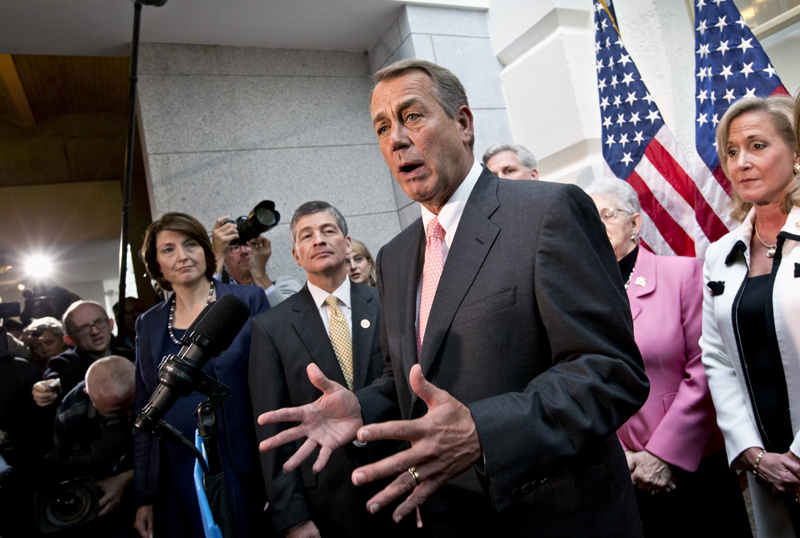 Across the Capitol, Boehner left open the possibility of launching a rival measure in the House on Friday. As he described it for his rank and file in a closed-door morning session in the Capitol, it would leave the shutdown in place while raising the nation’s $16.7 trillion debt limit and setting up negotiations between the GOP and the president over spending cuts and other issues. At the White House, spokesman Jay Carney told reporters the president would “likely sign” a short-term extension in the debt ceiling, and did not rule out his doing so even if it left the shutdown intact. Reid wasn’t nearly as amenable. “Ain’t gonna happen,” he said brusquely. By the time House Republicans had returned from the White House hours later, Rep. Hal Rogers, R-Ky., said part of their hope was to “quickly settle” on legislation to permit the government to reopen. Heartened by any hint of progress, Wall Street chose to accentuate the positive. After days of decline, the Dow Jones industrial average soared 323 points on hopes that the divided government was taking steps to avoid a default. Reid’s dismissive comments at the White House came at the end of the trading day. After more than a week of lost tourism, some governors prevailed on the Obama administration to let states use their own money to pay for national parks to reopen, Grand Canyon and Zion among them. There was a catch — the Interior Department made it clear it didn’t plan to reimburse the states after the shutdown ends. Senate Republicans forged ahead on an alternative of their own that would ease both the debt-limit and shutdown crises at once. Officials said that it would require Obama to agree to some relatively modest changes to the health care law that stands as his signature domestic achievement. Ironically, Boehner’s plan stirred grumbling among relatively moderate Republicans who said the shutdown should end, but little if any unhappiness among the staunch conservatives who often part company with party leaders. One Republican said he and fellow tea party allies deserved at least partial recognition for the plan that would raise the debt limit without reopening the government. “I actually went to (Majority Leader) Eric Cantor a couple days ago and I proposed this. I said, ‘You’re going to think this is crazy but I, as a conservative, would be willing to vote for a debt ceiling for six weeks.,” said Rep. Raul Labrador, R-Idaho. Republicans also were ready to claim victory on another front, noting that they were now in negotiations with the president, who had said repeatedly there would be none until the government was open and default prevented. For his part, Reid has proposed no-strings-attached legislation to raise the debt limit by $1.1 trillion, enough to prevent a recurrence of the current standoff until after the 2014 elections. Since the current standoff began more than two weeks ago, Republican demands have shifted continuously, while the president’s position has remained essentially unchanged. The shutdown began on Oct. 1 after Obama ruled out any concessions that would defund, delay or otherwise change the new health care law. He said he would be willing to negotiate on a range of issues, but only after the shutdown was ended and the debt limit raised. Republicans drafted a long list of demands to accompany any increase in the debt limit, including some that would raise the cost of Medicare for better-off beneficiaries, make changes to the health care law and roll back several environmental regulations either issued or in the planning stages by the administration. In recent days, the focus has shifted from the shutdown to the threat of default, and Republicans have spoken less and less frequently about insisting on concessions in the health care law. The call for negotiations on long-term deficit cuts would mark a return to basics for the House Republican majority. Shortly after taking control in 2011, the rank and file initiated a series of demands to cut spending, culminating in an agreement with Obama that cut more than $2 trillion over a decade. After four years of trillion-dollar deficits, the 2013 shortfall is expected to register below $700 billion. At the same time, the nation’s debt rises inexorably. It was $10.6 trillion when Obama took office during the worst recession in decades, and has grown by $6.1 trillion in the years since. Associated Press writers Alan Fram, Stephen Ohlemacher, Andrew Taylor, Jim Kuhnhenn, Julie Pace, Donna Cassata and Martin Crutsinger contributed to this story.